Welcome to 4900 Red Brick Run, a breathtaking waterfront estate nestled deep in Lake Forest on the glamorous West Isle. Situated on an oversized lot - nearly 3/4 of an acre - the home features a large front yard, back yard, AND 200 feet of water frontage. Sunny days can be spent by the nearly new pool and screen enclosure surrounded by updated landscaping. Programmable exterior lighting provides a showcase of the home after sundown. 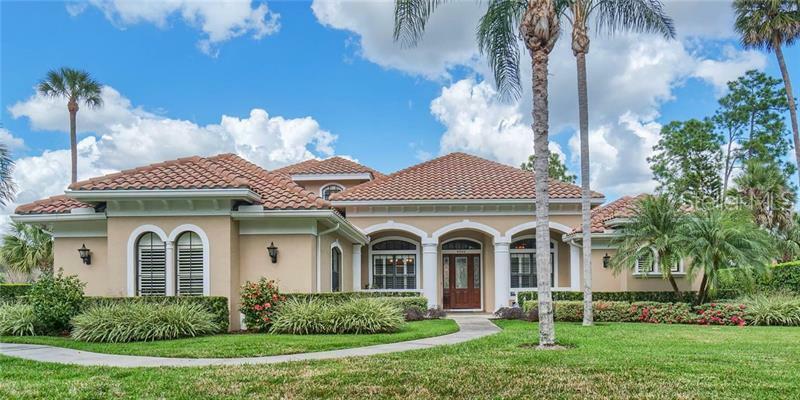 The home features polished porcelain tile, wood floors in bedrooms and staircase, crown molding and surround sound throughout, plantation shutters, gourmet kitchen with a large island and gas stove stop, and a cozy family room with a gas fireplace. The master suite is spacious with a sitting area and lanai access, dual walk-in closets, then on to the stunning master bathroom with a jetted tub and dual headed shower. Just outside the master suite is an executive office with a closet, which could also become a 5th bedroom. Formal living and dining areas give a traditional space for family gatherings and holidays. Two secondary bedrooms are located on the first floor, and another bedroom suite is located upstairs in addition to a large bonus/movie room with panoramic water views. Interior and exterior painted 3 years ago, pool, spa and screen enclosure were completed 2 years ago. The back yard features 3 exit gates with access to the water for fishing, kayaking or canoeing. Home has a side-entry 3 car garage and is located on a quiet cul-de-sac. May be under A/V surveillance. Pet Restrictions: Contact Aegis for current pet policies.